Are you bored and have some extra time on your hands? Or do you need to entertain someone for a spell? Well, here is a simple craft project that you can do that will entertain you and your friends. Plus, you get that warm feeling inside from making something fun! In this article you will learn the simple art of making a cube or dice. It is fairly easy and yet is fun to have when you are done. Plus, you can use it to replace dice you have lost, though they won't be nearly as good. 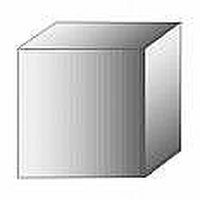 Once you have this design cut out you can continue making the cube. Take the three 1 inch sides and fold them at 90° angle, straigh up. Now you have 3 sides bent up. Take some tape and wrap tape these sides up by taping each sides end up. Once this is done you can move on to the finishing touch. What you box should look like. Take the 2 inch long piece and bend it up until one inch of it is level with the top of the other 3 sides. Then bend that top piece down. Tape it all up and you should have a box. See photos for help. How you finish your box. Have fun, this project is for people 4 and up. Don't cut yourself with the scissors. DO NOT GET A PAPERCUT!!!!! THEY ARE VERY PAINFUL!!!!! You can easily make a perfect cardboard cube with no raw edges showing by creatively cutting with a utility knife.